Sen. Toni Atkins and Assemblyman Todd Gloria announced support Friday for a new bill that would protect California’s environment and workplace standards from changes sought by the Trump administration. Senate Bill 1, authored by Atkins and two state Senate colleagues, requires that any federal environmental or worker-safety standard in place before Jan. 22, 2017, remain in effect under California law — even if the federal government rolls it back. 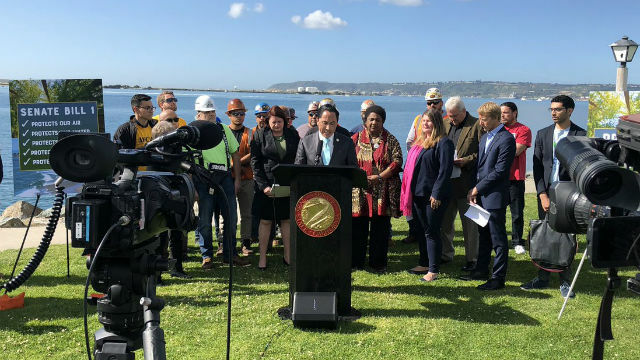 At a press conference on Harbor Island, the two lawmakers drew attention to more than 34 clean air, clean water and endangered species standards have been weakened or eliminated at the federal level. The bill cleared its first hurdle on Wednesday, passing the Senate Environmental Quality Committee. It must be considered by two other Senate committees before heading to the Senate floor and then the Assembly.